Built with a single Core Set and the Heirs of Númenor deluxe expansion. Mulligan for Defender of Rammas. On turn 1, leave Gimli ready to defend an attack so that you aren't forced to take the damage on The Banks (3 questing points). Use Beravor to draw, especially if you didn't find your Rammas with the mulligan. Travel to the The Banks on turn 1 and clear it turn 2 by questing with everyone. This might force you to take some undefended attacks and damage the other locations, but that's ok. You mainly just care about getting stage 2 (willpower questing) out of the game. Radagast's Cunning and Secret Paths can help you with this big push, especially if a Mumak or an Orc Camp shows up. Next, clear any other Battlegrounds that you can, while trying to collect damage on Gimli and drawing constantly with Beravor. Ideally you'll get out a second Rammas and you should be able to maintain status quo by questing with 2x Rammas, defending with Beregond, killing with Gimli, and drawing with Beravor. Quick Strike and Feint help to alleviate your defensive needs while the defenders quest, and if you've got these cards in hand, or a chump blocker in play, you can afford to send Beregond on the quest as well. Later in the game, if it switches to Battle, Gimli should be damaged enough to handle most of the questing, with help from Beregond+2x Dwarven Axe and the occasional Gandalf/Beorn for a big push. But with Gimli on the quest he'll be unable to kill enemies, so you don't want to stall too long or you will get overwhelmed. Your Traps can help here because they can put enemies out of commission without needing any attack. Or, you can aim to only complete The Banks (3 progress) and The Approach (7 progress) and let the Citadel (11 progress) fall to undefended damage. This will allow you to stay in Siege the entire game. You should be able to survive a single Master's Malice by naming Lore, but you won't want to get hit by more than that. If you are really worried about getting hit by another you can put a Citadel Plate on Beravor, or include some Lore of Imladris. It's a pretty hard quest, and even with this deck my win rate is only 3/7. I found it much easier to win when I managed to get a second Rammas out early. So while the deck works, it's not a hard counter to the quest. You can't really ask that much of a Minimum Purchase deck. Hope this strategy guide helped, and I hope you enjoy the quest! P.S. If you are just trying to beat the quest in progression mode and don't care about Minimum Purchase, swapping out the Gondorian Spearman for Winged Guardian can help your consistency quite a bit because then there are 6 cards that are good to have in your opening hand (also swap out Spear of the Citadel for Daeron's Runes). @SeastanWith two core sets, is there anything in particular you might sub in/out? @WandalftheGizzardI'd probably drop Veteran Axehand, Behind Strong Walls, and Spear of the Citadel. Increase Gléowine, Henamarth Riversong, Citadel Plate, Forest Snare, Radagast's Cunning, Secret Paths, Feint, Quick Strike to 3x. I tell ya, I don't know where FFG gets their difficulty ratings from. I believe you when you say that this is a hard quest, and the FFG difficulty rating of 4 clearly does not match the actual difficulty. This is why I always ignore their ratings. A rating of 3 can be 10. Yeah those difficulty ratings are sometimes way off. FFG's been doing better lately, though. 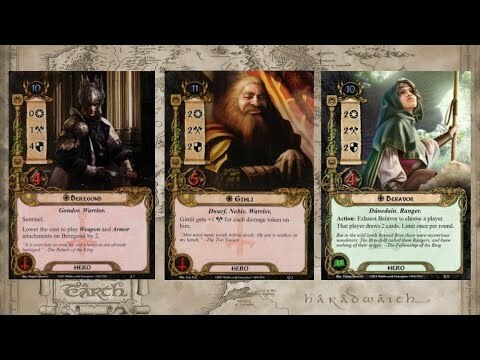 I recommend checking out the LotR Quest Companion. It shows quest difficulty scores voted on by users.